If you want to do something original with your photos, Slideshow Creator will allow you to create appealing videos with your images and with background music, in a very simple and quick way. Thus, you will be able to create presentations with your holiday pics, with your favorite song, to show them to your friends and that nobody ends up getting bored. The best thing about Slideshow Creator is how easy it is to use. When you launch Slideshow Creatir you will notice that it is divided into 4 tabs: photos, audio files, transitions and texts. 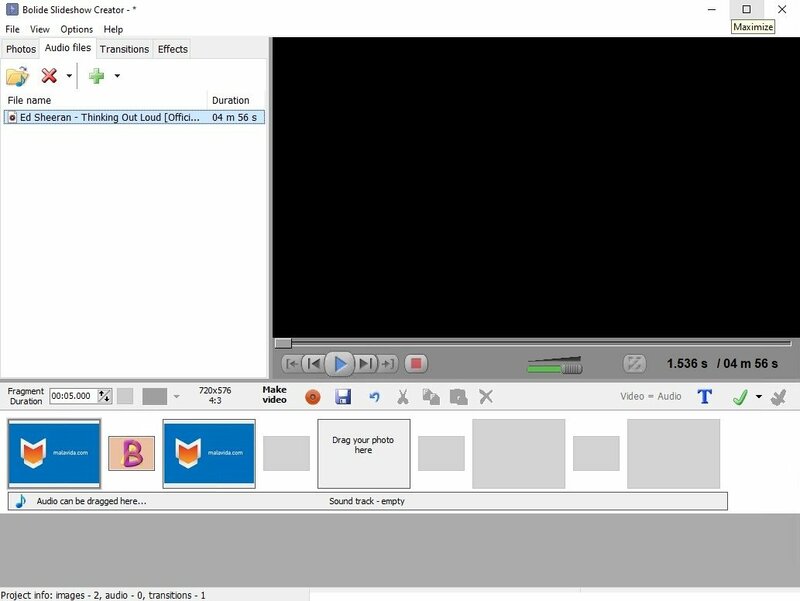 To create your videos all you will have to do is add these elements to the spaces in the bottom part of SlideShow Creator using the drag and drop technique. First open the images and place them in the spaces. Then choose the song that you want, the transitions that will be used between each photograph, and if you want any text to appear. 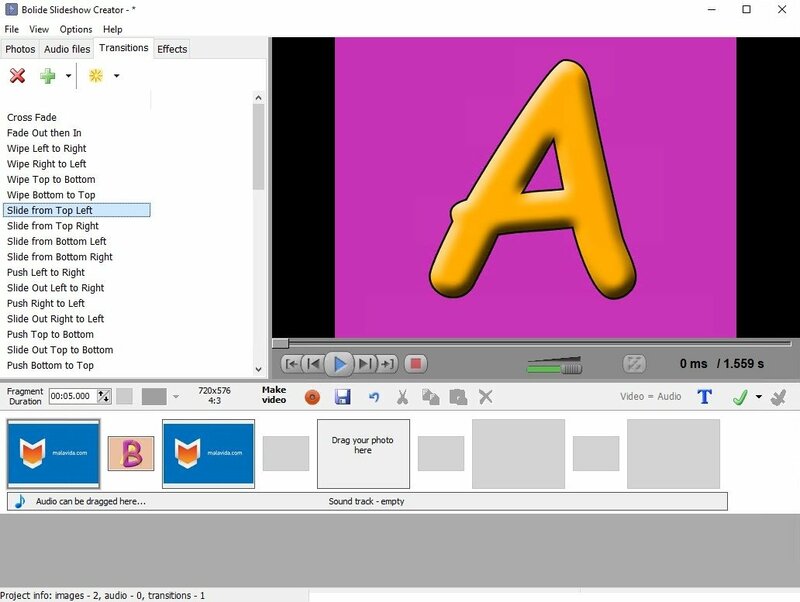 Last of all, click on Create video and choose the output format. 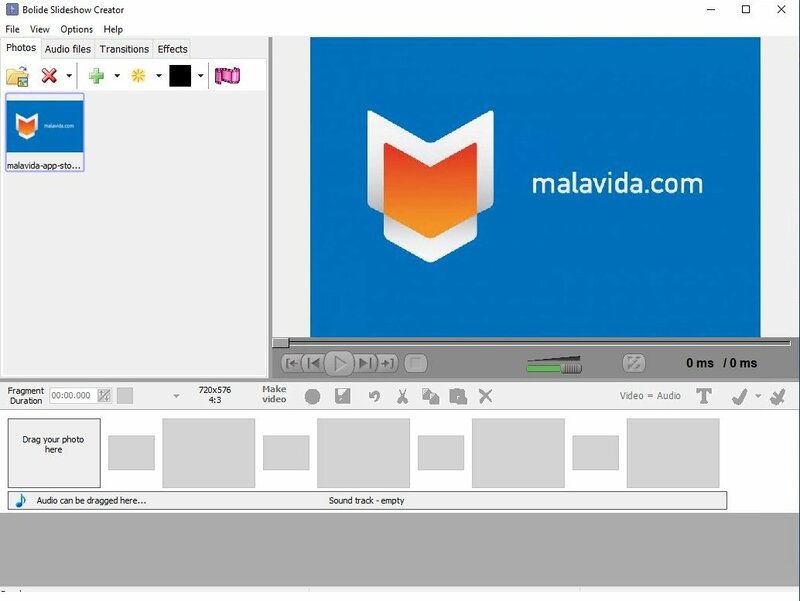 In a few minutes, Bolide Slideshow Creator will generate the video with your photo presentation. Slideshow Creator supports any still image format and various audio formats, like MP3, AAC, MP4, OGG or WMA. In what regards to the video, it allows the possibility to create them in AVI, WMV and MKV, with high resolution and quality. Don't think about it twice, download Slideshow Creator for free to easily create your image presentations.